Kaye comes to us from an extensive background in the customer service industry. Throughout her three decades of customer service experience, she served 13 years in the Air Force, worked within the restaurant and hospitality industry, and spent her last eight years as a customer service representative and sales coordinator for a newspaper company. This immense experience, coupled with her exuberant personality no doubt made her an excellent fit for the Customer Service team at SPC, where she spends her time helping out all of you: providing helpful assistance over the phone and online, processing orders, and just about anything you would need to fulfill your pipe and tobacco needs. 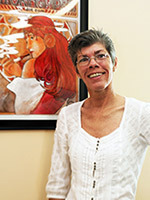 Born in Virginia, Kaye moved to South Carolina in 1977. Basically, she'll do anything to be outside; yes, even yard work. And in what may be the greatest example of yin and yang, she owns both a poodle and a Harley.